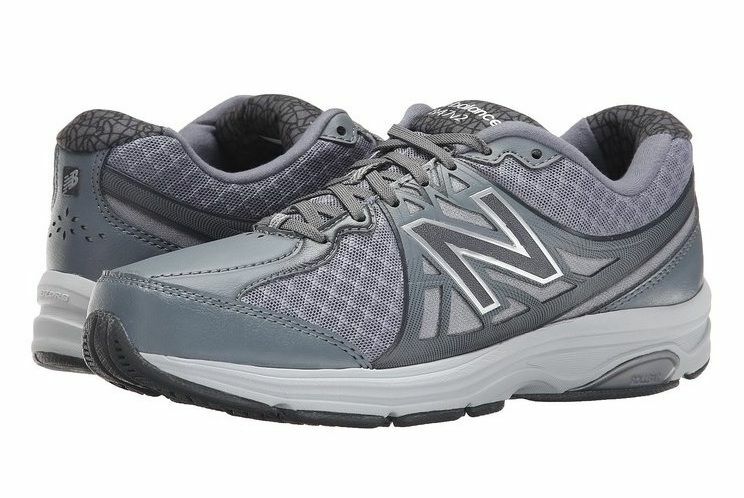 The New Balance 847 is the company's stability health walking shoe, designed specifically for walkers. It has excellent cushioning and is flexible. It's available in both men's and women's designs and in a wide range of sizes and widths. It's Medicare rated as a diabetic shoe. New Balance replaced the popular 841 with the New Balance 846, which was in turn replaced with the 847 and the 847v2. Medicare-rated diabetic shoe with seamless liner and lightning-dry liner to help prevent hot spots and blisters. Those who loved the 841 and 846 might not get the same fit with the 847. The 847v2 is a further modification. New Balance puts running shoe technology into its high-quality walking shoes. This shoe is a favorite among serious walkers who are looking for stability and cushioning without sacrificing flexibility. This shoe is built on New Balance's straight SL-2 last. This last is narrower in the heel, has a high instep, and a deep and wide toe box. It's good for those with high arches. It has a replaceable insole if you need to add your own custom orthotic. For those who tend to overpronate, meaning their ankle rolls too far downward and inward with each step, this shoe has a graphite rollbar, medial post, and TPU post to correct your gait. New Balance designs the 847 with a walking strike path outsole which aims to correct the gait. If you naturally have a neutral gait, this may be more correction than you need and the shoe may feel stiff. The seamless liner of this shoe is made with their lightning-dry fabric to wick away moisture, which can help prevent blisters. The shoe uses Ortholite padding in the heel, collar, tongue, and liner for cushioning. Heavier walkers are well-supported with this model. The shoes are built with a rubber N-Durance outsole to give the shoe a longer lifespan. The shoe has a 12-millimeter drop from heel to toe. The drop is a measure of how high the heel is relative to the toe. These shoes have a traditional amount of drop for a walking shoe, but not the minimal drop seen in many newer flat designs. New Balance produces the 847 in narrow, normal, wide and extra-wide (A, B, D, E) for women and up to extra-extra-wide for men to fit a variety of feet. Women's sizes are from 5 to 13 for the normal width. Men's sizes are 7-15 for the normal and wide widths. This shoe is available in muted colors. white, black, and silver/gray. I like having a black shoe to wear for travel or at work and school. It doesn't come in any fashion colors. This 847 is a good choice for health walking and for an everyday walking shoe for those who want stability.